The Great Chicago Fire Festival promises pyrotechnics. Ladies can whale on guitar just as well as the boys—heck, sometimes even better—and local female ax mavens are gathering at ShredFest to prove it. White Mystery's Alex White and the Lemons' Kelly Nothing team up at Pilsen's ChiTown Futbol to host the event, which will feature performances from Swimsuit Addition, Bleach Party, and Cassie Ramone. Come celebrate Chicago's most colossal disaster with craft vendors, food, and entertainment at Redmoon's inaugural Great Chicago Fire Festival. The free festivities aim to unite Chicago's neighborhoods by honoring the city's renewal and triumph following the fire of 1871. 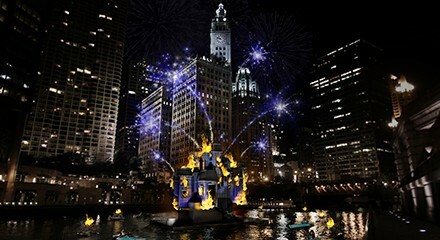 A ceremonial performance reenacting the blaze will be brought to life with floating sculptures in the Chicago River. Get into the Halloween spirit early this season and see what creepy things were uncovered during the Logan Theatre's recent renovation at the horror movie poster exhibit at I Am Logan Square. The vintage movie memorabilia includes posters for the likes of Tentacles (1977) and Golden Needles (1974).